Today we both got up in the 5:15-5:30 time frame. There was ice and frost everywhere when we got up and opened the tent. After packing up our bags, we grabbed breakfast. As we would realize over the coming days, breakfast was basically the same every day, with hot porridge, toast, eggs and bacon. After breakfast, we set out from Shira 1 camp to Shira 2 camp on a nice, relatively flat plateau. After a short while, we took a nearly invisible detour to the right, veering off of the main trail onto a separate trail heading for the Shira Cathedral and Shira Needle. 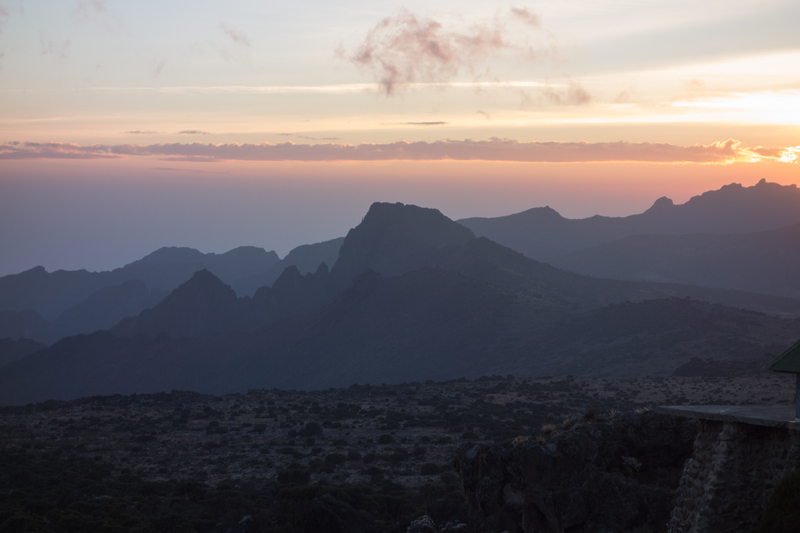 Many people detour to the Shira Cathedral for acclimitization hikes, but usually after making camp at Shira 2. We had read in our book about just walking straight there on the way from Shira 1 to Shira 2, and Joseph endorsed the idea. It was nice, because we had the trail entirely to ourselves, with so much less dust. Threre were a fair number of jackal tracks and feces, but no jackals to be seen. 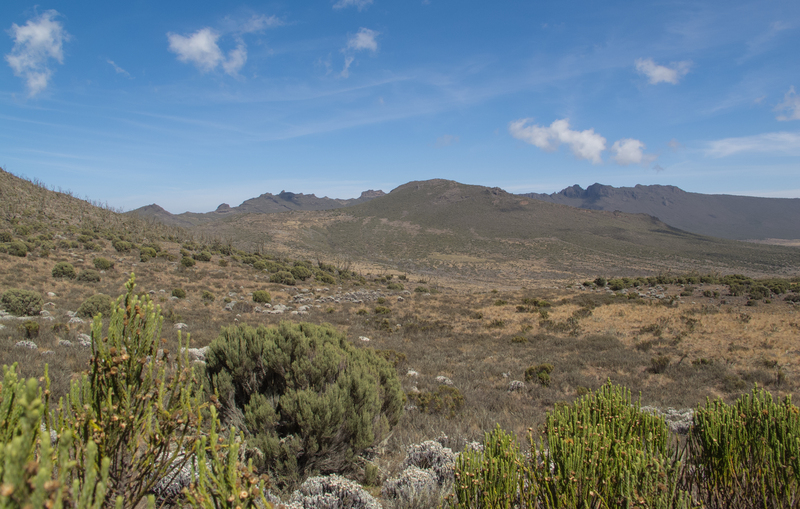 Joseph told us that the Lemosho route was basically started by animals - the track that they trampled over time. Apparently Kilimanjaro acts as a refuge for animals used to having water (such as at Amboseli NP in Kenya) that need water during drought periods. 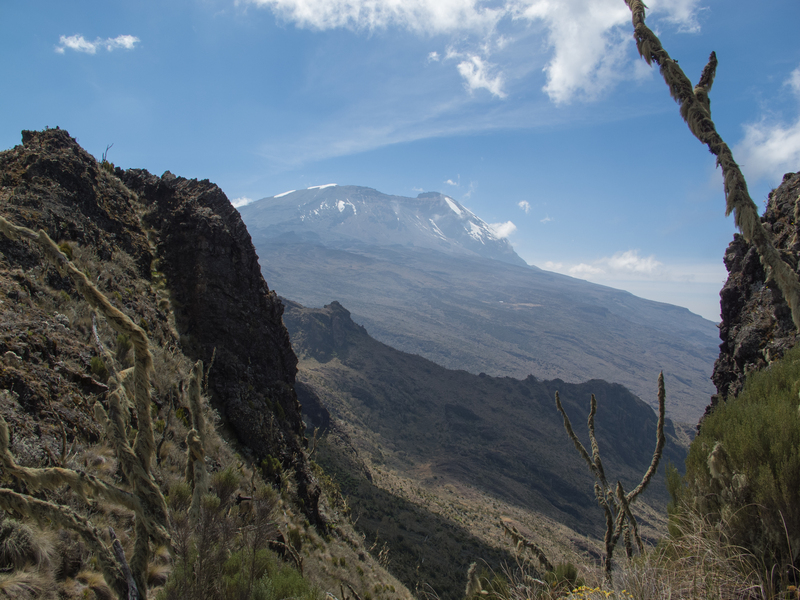 Kilimanjaro has much more regular rains than the surroundinng plains. The trail had lots of ericas and everlastings, but all the plants were noticeably shorter than the day before. Crystal was very winded, as we'd come up a long ways in 2 days, and we seemed to be walking faster than the previous two days. It might have been because there was no stopping, as no one else was on the side trail that we were on - we had it completely to ourselves. We got to the Shira Cathedral (3862 meters, 12,671 feet) in the late morning, and took off our backpacks (except for Justin) to walk the last little bit up to the top, which involved some scrambling. 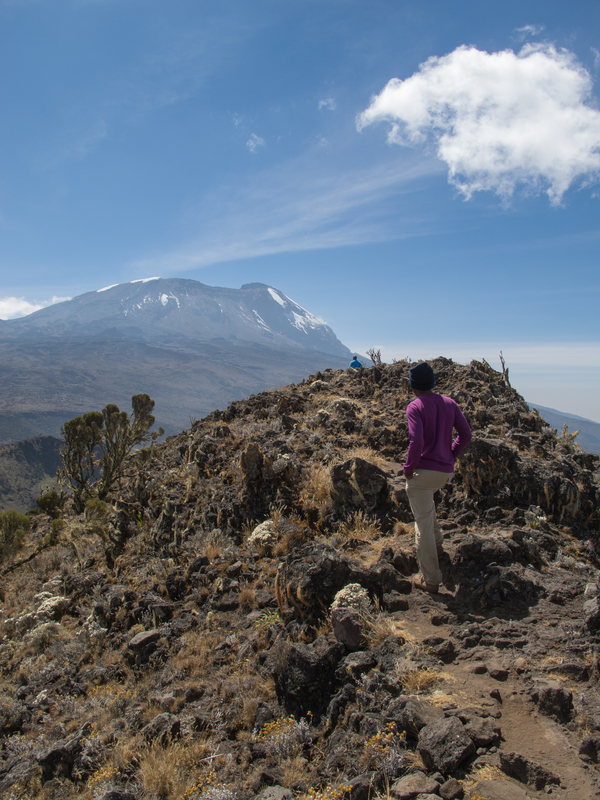 At the top there were good views of Kibo, and distant views of Mount Meru, which had been behind us for most of the walk. 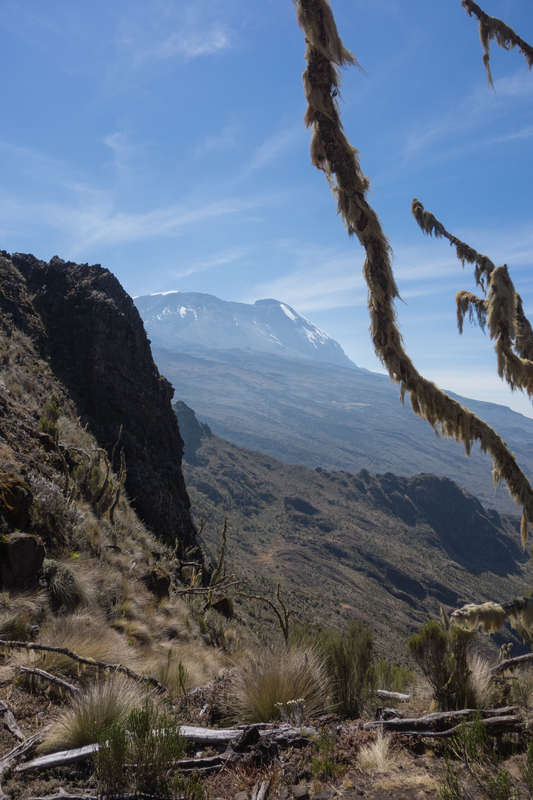 Mount Meru is close to Arusha, a good distance west of Kilimanjaro. While Meru had looked very tall when we were in Arusha, it now appeared to be about eye level. On our way down from Shira Cathedral heading to Shira 2, we passed a Heli-Pad, to evacuate people in medical emergencies. Thankfully it was empty when we walked past. 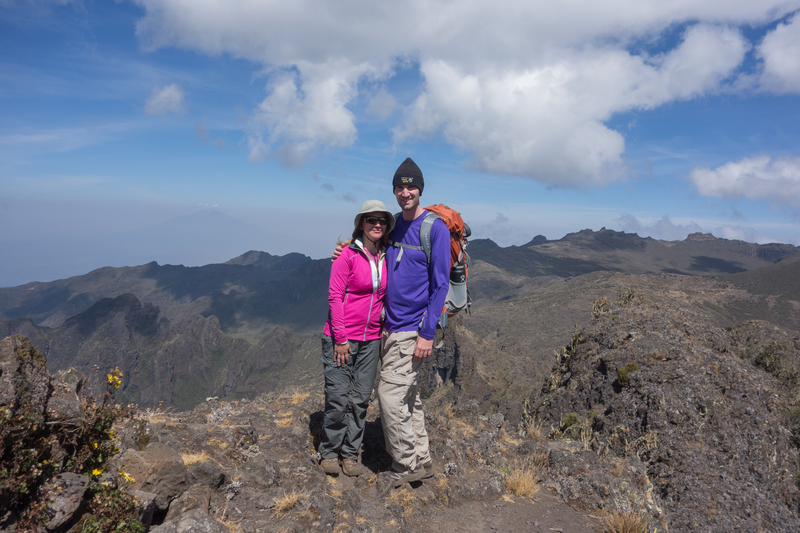 We got to Shira 2 camp (3895 meters, 12,779 feet) around 12:30, with both of us a little tired and ready to eat. It must have been the altitude, because the hike itself didn't seem too bad. After lunch, we went back to the tent and read, with Crystal taking a nap. We had snacks at 4:30 with Joseph, and he told us quite a bit about being Maasai, and his family. Among other interesting tidbits, apparently his grandfather had 8 wives. He told us lots of stories about the masaai culture, all very interesting. Justin joked about being maasai himself, explaining that's why he didn't eat any vegetables, and also saying he had four wives of his own, but Crystal was the only one who would climb the mountain. After that, we went back to the room and read some more, plus finished our cribbage game from the day before. Meanwhile, the crew played their own card game (see video above). Dinner was, presumably, made from the supplies brought by the additional porters. We had steak, fried potatoes, and pumpkin soup. We chatted for a bit, then went back to the tent. Once again, we could make it only to 8 before crashing.